Due dates can be used in issues to keep track of deadlines and make sure features are shipped on time. 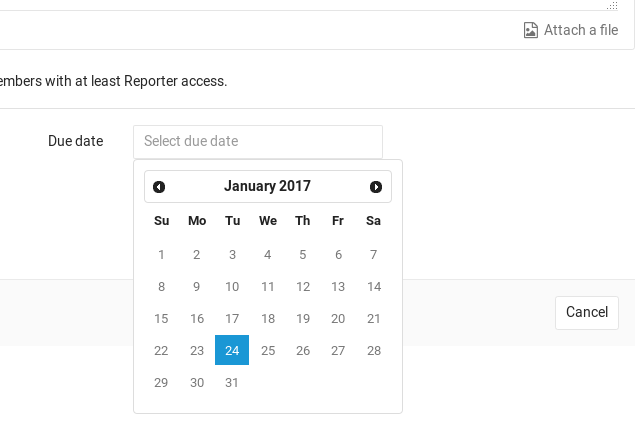 Due dates require at least Reporter permissions to be able to edit them. On the contrary, they can be seen by everybody. When creating or editing an issue, you can see the due date field from where a calendar will appear to help you choose the date you want. To remove it, select the date text and delete it. A quicker way to set a due date is via the issue sidebar. Simply expand the sidebar and select Edit to pick a due date or remove the existing one. Changes are saved immediately. Issues that have a due date can be distinctively seen in the issue tracker displaying a date next to them. Issues where the date is overdue will have the icon and the date colored red. You can sort issues by those that are Due soon or Due later from the dropdown menu in the right. Due dates also appear in your todos list. The day before an open issue is due, an email will be sent to all participants of the issue. Both the due date and the day before are calculated using the server's timezone.